At the Huyck Preserve, research-based environmental education is an integral part of our mission, and, as one of the nation's original biological research stations, we are uniquely specialized for such hands-on scientific teaching. Typical programs use our lands and waters as outdoor laboratories for science and exploration lessons aligned to current New York State Science Standards. Through immersion in nature and the scientific process, we bring classroom lessons to life. Our most popular lessons focus on aquatic and terrestrial ecology, forest health, food webs, and invasive species biology. All of our programs can be tailored to your class' age group, learning level, and curricular objectives. We will also work with you to design a new program to meet your needs. Typical field trips include an inside lesson on the topic of the day, outdoor field work or exploration, data interpretation when applicable, time for lunch, and a guided hike. For interested groups traveling longer distances, On-site housing is available for overnight visits, and we also offer classrooms and meeting spaces to accommodate your own programs. We welcome student groups of all ages - elementary, high school, and college - to come spend a day or night immersed in nature at our field station. Most programs cost $5 per student unless otherwise noted. If you are interested in scheduling a program, please download the Program Request form using the button to the right, complete it, and send it to education@huyckpreserve.org. Have questions about programming options or don't know where to start? Let us know! Most field lessons run 2-3 hours. Add a no-cost hike and stay for a picnic lunch to round out the day. A full-day visit typically runs from 9:30 am-1:30 pm. These lessons, geared to our youngest classes, have students learning about the environment through fun, hands-on interactions with nature. Students learn about what plants and animals need to survive (K-LS1-1 and 2-LS2-1), how their survival requirements determine where they live (K-ESS3-1), how they interact with their environment and each other (K-ESS2-2 and 2-LS2-2), and how humans impact living and nonliving components of the ecosystem (K-ESS3-3). The focus of these lessons can be terrestrial with forest exploration and/or aquatic with pond or stream exploration depending on interest and season. Pond's edge scavenger hunt - What creatures are lurking within arm's reach of the pond edge? Students are always amazed to find amphibians, fish, insects and other invertebrates that they didn't know existed under the water's surface. Tree bingo - Get to know trees through bingo. Learn basic tree and leaf types and talk about the importance of forests in the environment. Fall leaf collect and craft - Students collect fallen leaves and bring them back inside to match with easy-to-use identification cards. They can then use the leaves to make a rubbing picture to bring home to remember the day. Decomposer scavenger hunt - Who is hiding under the leaves and logs? Find out in a nature lover's version of hide and seek! Why are they there, and why are they so important to the ecosystem? Education classes at the Preserve survey streams in the Lake Myosotis Watershed to examine population changes in the invasive rusty crayfish and the impact this species is having on native species. Students learn how to identify crayfish species and proper collection techniques. They become experts in the concept of habitats and begin to understand invasive species as a form of environmental change affecting other organisms. This program introduces concepts of aquatic ecology, invasive biology, organism structure and function, and the connections between physical habitat factors and species populations, and can be expanded to include water quality data collection. Data collected by students will be used to assist Preserve scientists as they determine where to focus their conservation efforts of native species. Students learn how to identify macroinvertebrates in the ponds and streams around the Preserve, and to understand how some species can be indicators of water quality. This program introduces concepts of aquatic ecology, species identification, insect ecology and metamorphosis, and water quality while students learn to dip net in streams or ponds. 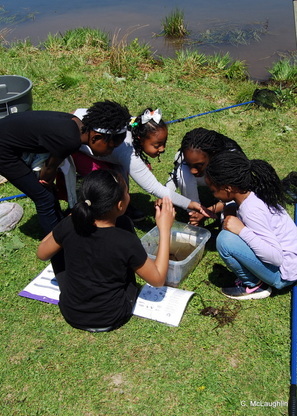 This program can be an introduction to aquatic habitats for younger students and a math lesson calculating water quality indices for older students. This program teaches lessons on forest ecology, food webs, and/or adaptations through field work and data collection. In the end, we review the students' findings and discuss what they mean for the forests of the Huyck Preserve. We conclude the trip with a hike to other parts of the forest to reinforce what the students have learned. Ideal for fifth grade, this program introduces the concept of food chains and food webs and focuses on the unsung heroes of ecosystem ecology, the decomposers. After a brief introduction, the day is focused on identifying decomposers on and around fallen logs, as well as under leaves, using simple but authentic field methods. After lunch, a review of the data leads to a discussion of the important role that dead plant material plays in the forest and the enormous contribution of decomposers to food webs. We continue to look for decomposers and other food web components as we end the day with a hike. Students are introduced to the concepts of populations and the factors that affect population size, as well as what population size can tell us about habitat quality. Students will learn about field sampling methods. Then, using a basic field guide, students will identify and count plants and animals along forest transects. We will use these data to make larger generalizations about the number and kinds of species found on the Preserve. Focused on community or ecosystem ecology and adaptable to seventh grade and high school-level classes, this program teaches the valuable roles that forests play. 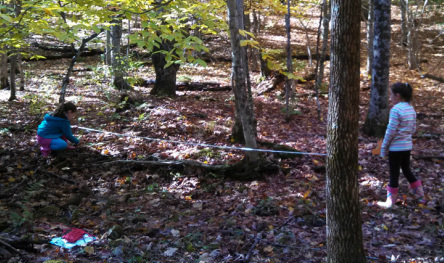 Students measure different variables to begin to understand how to determine forest health. They get a refresher on coniferous and deciduous trees, learn how to assess a tree's health, inventory understory and canopy trees, learn about the value of dead wood in a forest ecosystem, and more! Students play an active role in their data analysis and interpretation. The day ends with a hike to a different area of the Preserve to reinforce forest health concepts and see some of the forest health issues in our forests up-close. Kelly Martin, President of the New York Council of Wildlife Rehabilitators gives students a close-up look at New York's native species. Students will have the opportunity to learn to identify some of New York's common and rare wildlife, ask questions about their lives in the wild, and learn about animal rehabilitation. Kelly's animals are non-releasable education animals which provide a unique opportunity to see wildlife up close. Cost: $150 flat fee for a 1-2 hour program. Schools visiting on multiple days may be eligible for a discounted animal program cost. Please inquire. 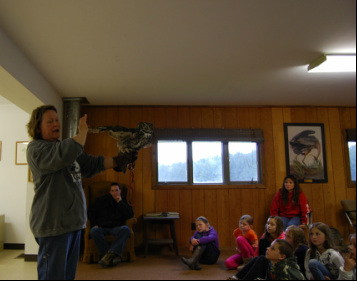 If done in conjunction with another Huyck Preserve lesson, this wildlife lesson fee is in addition to the $5 per student field trip fee. 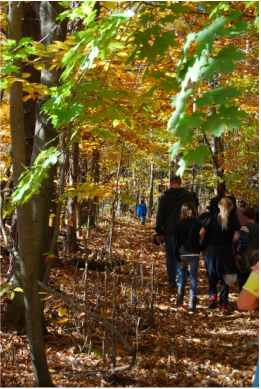 Hike the Huyck and learn about the natural history of our area. An excellent addition to an aquatic or terrestrial ecology program, students will have the opportunity to traverse through a multitude of habitat types from early successional forest to old growth hemlock stands and beaver constructed wetlands. Hikes are tailored by age group for content and physical ability, and can be booked alone or as an addition to another program. Cost: Starting at $5/student for 30 minute-1 hour hike on average. When possible, we facilitate vists by economically disadvantaged rural and urban public schools in the greater Capital District region through our transportation reimbursement program. To apply for funding, please download the form below and email the completed form to education@huyckpreserve.org. Please note that, depending on available funds, requests may be funded in-part or in-full. A final invoice from your transportation department reflecting actual trip expenses is required before reimbursement can occur.